Queen of Castile; joint sovereign with Ferdinand V; patron of Columbus. 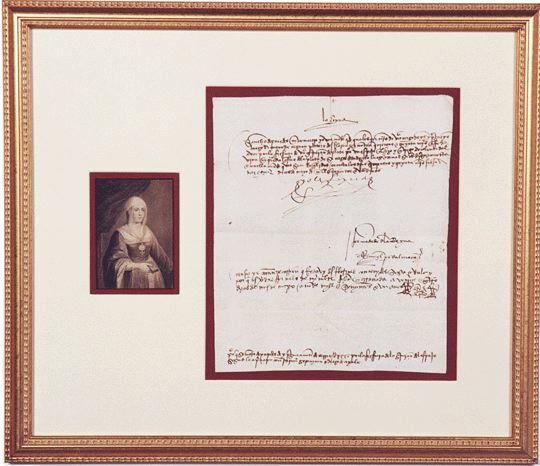 Document Signed, yo la Reyna, [I the Queen], one page, legal folio, May 17, 1501. 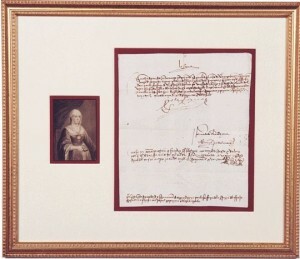 The Queen orders her chamberlain, Sancho de Paredes, to pay the sum of 530 maravedis, or two florins, to a silversmith named Anton de Carrion for work on a mirror. With a receipt from the silversmith and a summary of the document at the foot. Matted in cream and maroon with a half-length portrait of the queen. In an antiqued gilt frame measuring 19 5/8 inches wide by 16 7/8 inches high.